Bird strikes are a growing hazard for aircraft operators and pilots. According to the FAA, there have been 142,000 wildlife strikes (97 percent of which were the result of birds) with aircraft in the United States between 1990 and 2013, killing 25 people and injuring 279 more. Since 1988, at least 255 people have been killed as the result of bird strikes. Although bird strikes remain fairly low-risk, they are an increasing hazard that the FAA and other industry groups are working hard to mitigate. Perhaps the most famous aircraft accident resulting from a bird strike is US Airways Flight 1549, which landed in the Hudson River just two minutes after departing from LaGuardia. The A320, piloted by Chelsey "Sully" Sullenberger, experienced a dual engine failure after hitting a flock of birds. The aircraft landed safely in the Hudson River, and everyone on board survived. US Airways Flight 1549 is a remarkable story because the actions of the crewmembers saved the lives of all of those on board the airplane, but bird strikes aren't all that uncommon, and many aircraft are damaged each year after birds fly into them. In the U.S. alone there are about 10,000 wildlife strikes each year, causing hundreds of millions of dollars in damage to aircraft. A bird strike is when a bird collides with a man-made flying object like an airplane or helicopter. Bird strikes usually occur during low altitude flights, takeoffs, and landings. A bird strike can cause very serious damage to an aircraft's structure and when ingested, an airplane's engine or engines. Most bird strikes involve geese or gulls, and most, while not fatal, cause serious damage to the aircraft and/or its engines. According to Bird Strike Committee USA, the number of bird strikes is increasing every year. A bird hitting an airplane will definitely cause damage, often not enough to cause an emergency or injuries to the crew or passengers. But depending on how large the bird is and where it impacts the airplane, the damage can range from a small dent to a broken windshield or a complete engine failure. In the case of US Airways Flight 1549, damage can even affect more than one engine, and although rare, can cause an in-flight emergency or a power-off landing. Wildlife management is an active part of every airport's operations planning. 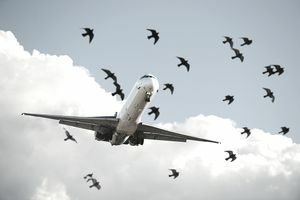 Airports take an active role in keeping birds and other wildlife away from airports through habitat manipulation like removing trees, keeping grass cut low, utilizing loud noises like cannons, and introducing birds of prey, which can act as a visual repellent to deter flocks of gulls or geese. In addition to local airport wildlife management programs, the FAA has a Wildlife Mitigation Plan that focuses on guidance, research, and outreach to educate airport managers and other industry players about wildlife management around airports. A group called Bird Strike Committee USA is directed by a steering committee including people from the FAA, U.S. Department of Agriculture, Department of Defense and public and private organizations. Bird Strike USA provides resources and promotes the sharing of information regarding bird strikes in the U.S. The U.S. Department of Defense, along with the U.S. Air Force and the FAA, have combined forces to create the Avian Hazard Advisory System, which uses a Bird Avoidance Model to assess the bird strike risk at certain airports and low-level military training routes. Finally, the Bird/Wildlife Aircraft Strike Hazard (BASH) prevention program is used by the Air Force and Navy to further reduce the risk of bird strikes.